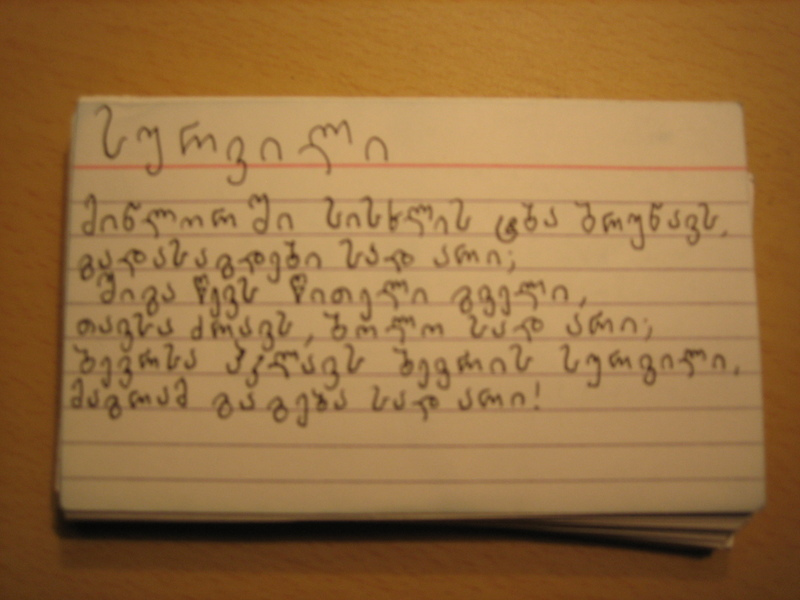 In preparation for teaching in Georgia we’ve both been trying to practice “kartuli ena” (Georgian Language). We’ve been working through Dodona Kiziria’s “Beginners Georgian,” which has a great preface about the history of the country’s unique alphabet and language. Georgian is spoken by the approx. 4 million people in the country and by emigres in diaspora. 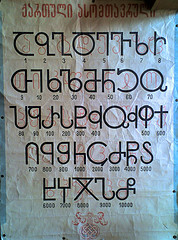 The first Georgian alphabet, asomtavruli,was created in the fourth century, probably based on Greek and Phoenician letters. It can be seen in its earliest forms chiseled on church floors in Georgia, as well as in churches in Greece, Palestine, and Egypt where Georgian clerics would travel to study their new found faith (Christianity, which was adopted sometime in the middle of the third century AD). In the nineteenth century, when Georgia became a part of the Russian Empire, a policy of Russification began that banned the use of Georgian in official institutions. 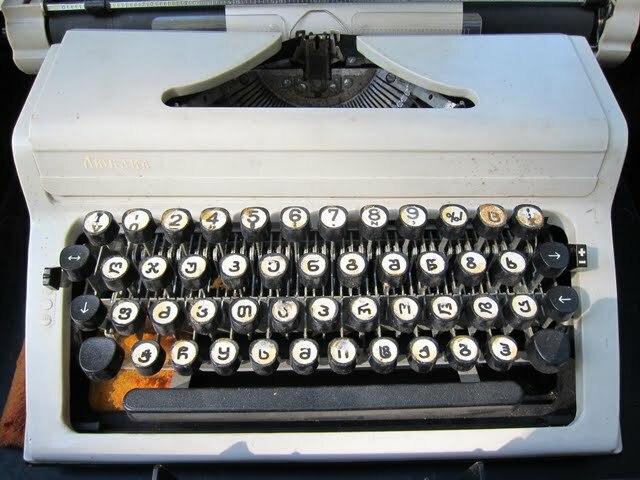 Thanks to the intense efforts of Georgian intellectuals, Russian censors eventually allowed the publication of magazines and newspapers in Georgian. 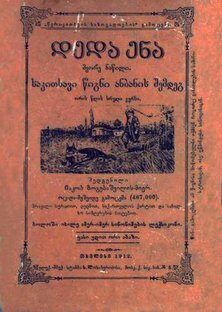 Jacob Gogebashviliv published a primer for elementary school children entitled Deda Ena in 1876 that is still used in the first grade. Starting in the 1920s, the Soviet educational system encouraged universal literacy and provided free education. They instititued a program of native language education in an attempt to combat the 70% illiteracy rate across the USSR. By 1979, Georgia had the greatest number of people with university and college degretes in the Soviet Union. 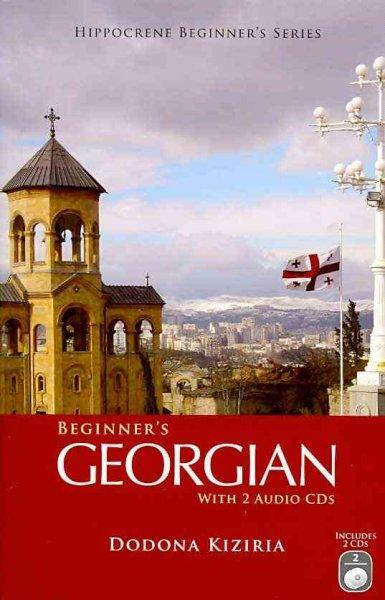 In the books we have read so far, Georgians seem intensly proud of their alphabet and language. 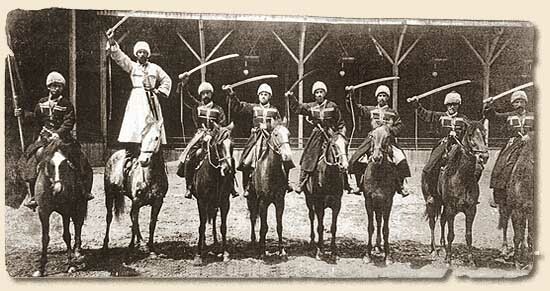 Their claims concerning its longevity may sometimes be a source of bad blood between them and their neighbors. In his book Eastward to Tartary, Robert Kaplan, during a conversation with an Armenian, insinuates that the younger Armenian alphabet looks “similar” to the Georgian. The Armenian replies by telling him a joke in which the Georgians decide on the letters of thier alphabet by throwing a bowl of spaghetti against the wall. A lake of blood swirls in the meadow, where is the stream flowing out? Within lies a crimson serpent, its head moves; where is its tail? Loving too much brings doom to many, but has anyone understood?